SWBAT evaluate algebraic expressions by working in groups of 3 - 4 to earn achievements. Students enter silently according to the Daily Entrance Routine. The find a do now on their desk with four questions: three substitution questions and 1 order of operations questions. Both of these topics have been reviewed in prior classes, so the class work and exit ticket for today’s lesson will be graded. Students are given 4 minutes to complete all questions. As students are working I am walking around looking for neat examples of student work. I ask students to put their work up on the board whether it is all correct, some correct, or all incorrect. Students do not have to be finished with all problems to get an opportunity writing at the board. They must be trustworthy enough that I can depend on them to return to their seats quickly and copy the rest of the work. The idea is to get students to care about the process instead of only focusing on “the right answer”. Many students not putting the work up on the board will often try and talk to the students at the board, saying things like “that’s wrong” or “that’s supposed to be [numeric value]”. If I see a student doing this, I walk over to them and say, “please don’t help, I would prefer this student’s original work”. Students often omit work as shown in the example above. I ask students to evaluate the work on the board and pretend they are the teacher grading it. I let them know that while the answer is correct they need to determine if the students gets full credit or partial credit based on the way that the work is shown. For #1, students discuss whether this particular work would get partial or full credit. I settle the discussion by explaining that while this student would likely get full credit, there is a danger of dropping sign or entire numbers when some of the work is omitted. We close out this section of class by putting away our do now into our binders. Students get 2 minutes of “social time” while I distribute index cards and vocabulary sheets for the next section. 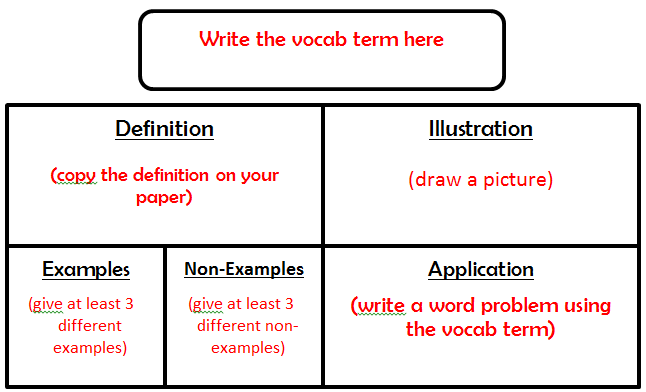 Students receive a sheet of paper listing 11 vocabulary words to be used on this algebra unit. Students are directed to use their 4 index cards to create vocabulary cards for the 1st four words on the list: variable, coefficient, term and constant. Students must model their cards after the ones I’ve made for them in the past, using the Frayer Model. Some students may need thee visual anchor below which I display on the SMARTBoard during this time. This is a good opportunity to check in with students who either struggle with graphomotor skills (I have several this year) and also review these complex concepts with students who have struggled with algebra in the past. These students may need additional scaffolding to create the difficult parts of their cards, such as the word problems and the non-examples. I focus on the non-examples more than I do on the application because so that I can address common misconceptions. It's also a great opportunity to normalize mistakes. For example, one of the words they need to create a vocabulary card for is "variable". I ask some students to explain whether the term 2x is a variable or not. If they mistakenly say it is, we've identified a non-example! So rather than feeling bad about making the error, students can feel glad that they caught the error before it affects them on an assessment. Next, students work together in a “numbered heads together” activity. They must complete 16 problems where substitution must be used to evaluate algebraic expressions. The first 9 problems are to be completed using clickers and the last are completed on the hand out. Students work in groups of 3 to 4 students. Groups are formed by counting off from 1 to 6 all the way around the room. After counting off, all the 1s will form a group, all the 2s will form a group, etc. In this activity I want the students to be randomly assigned so that they are exposed different peers, not just their friends. Also, I've been having a hard time with groups of friends socializing rather than completing the work, so I decide to try out the random assignment today. Once they are at their groups, students will receive an envelope with 4 small, square sheets of paper inside. Each paper will have a number written on it (#s 1 - 4). Each student in the group must take a number (those in groups of 3 will need to have one student take two numbers) and write their name on the back of the small, square paper. Then, I explain the rules of the activity. For each round, all groups are given 5 minutes to solve. After 5 minutes, I will use a random number generator to select one student from each group to explain that problem. Thus, students must work together efficiently so that everyone understands the answer and how to get to it. Students will be earning Achievement Points based on these responses. I decided to use problems with exponents because my students are struggling with that particular type of problem. Some students would answer with an insufficient, “the answer is –5” and I would shake my head. He needed to explain how he solved the problem. "What was the initial problem? What was substituted? In what order were the operations done?" These are some questions I would ask to give them a second chance. Students must complete an exit ticket (attached in the "task") which includes an order of operations problem. It will be turned in at the end of class as students leave the room. For this exit ticket, I am looking to check in on students' ability to work with fractions in order of operations problems. The use of the exponent in the problem is something I have started to notice many are struggling to understand. I would like to use the results of this exit ticket to plan the rest of my lessons, determining which fraction skills need remediation.